Every day I drive by a pasture on my way home from work. There are acres of golden grass in the late afternoon sun, a few isolated trees, and often some cows. The grass is so tall that you really only see the tops of the cows in the golden grass and I have had this idea that I would be able to get a good composition with this one day. So, I started packing my camera gear to work with me every day and every day I would drive by and the cows would be in another pasture somewhere. This got frustrating, having such ideal conditions and no cows. I felt like the lonely tree and the grass couldn’t hold the composition enough to be interesting. One day I finally just found a place to park and set about seeing what I could come up with. I tried isolating a tree or two with cows in the distance, but the cows didn’t really read well and this was not working. Then I noticed this red barn in the distance that really worked well with the golden grass. There was also a bit of a breeze blowing, so I decided to go for a long exposure to blur out the field of grass. 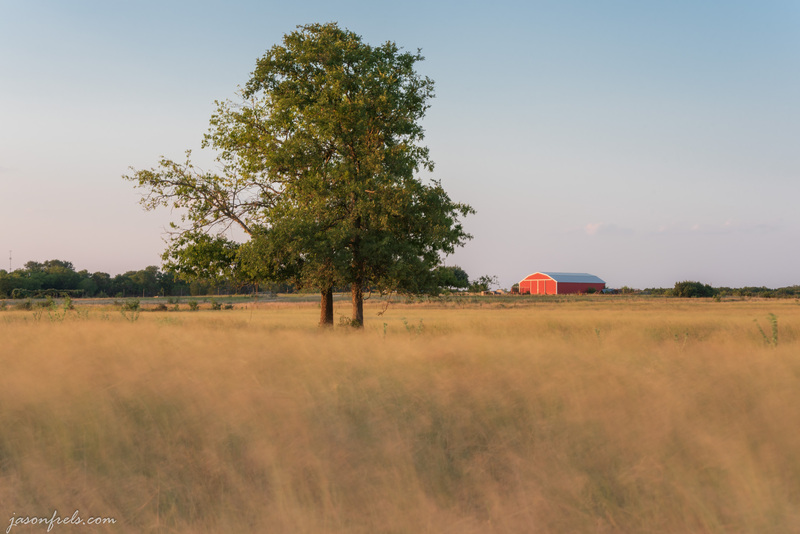 In the photo below, I have a couple of lonely trees in the foreground and the bright red barn catching the afternoon sun in the background with a sea of gold from the blurred grass. I would love to have a cow or two in the foreground, so maybe I will keep checking as I drive by in the future. This was shot with a 10-stop ND filter to get the long exposure. I was using a bit of a long lens as I was shooting across the pasture from the edge of a fence. I think that the red barn really works, but it could be bigger. I tried zooming in but that tree in the foreground really starts to overwhelm. I wish the sky was a bit more interesting, but it is mostly haze on the horizon. There is a lot of housing development off to the right that I was shooting around as well. Editing this in Lightroom, I made the white balance warm and put a graduated filter across the grass to reduce clarity a bit. Other than that, I didn’t do much. I like the way it turned out. I will keep checking this place out and maybe the rancher will bring the cows back. But for now, I am on vacation. Thanks for reading and please leave a comment below. I like the “misty” effect of the grass with the long exposure. I have had this notion for a while with the grass. The cows do not cooperate with me.